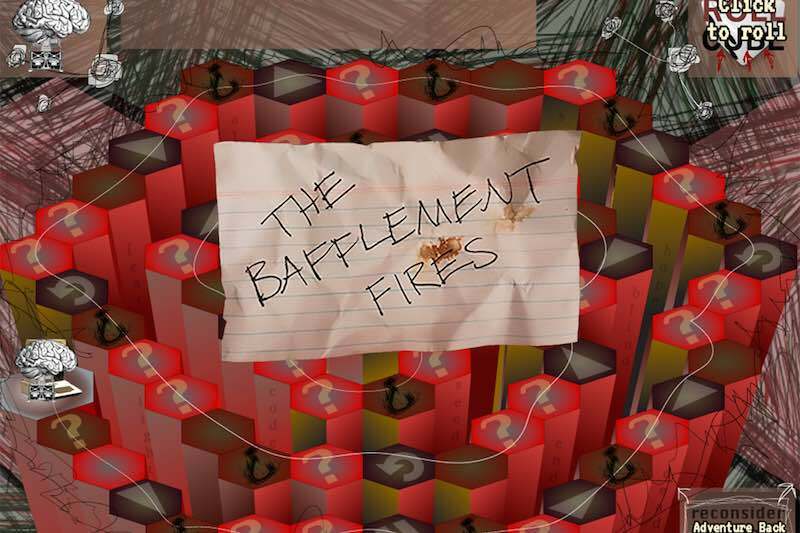 New Binary Press is proud to announce the publication of Jason Nelson’s The Bafflement Fires, an interaction fiction/poem in the form of a digital recreation of a Freemason board game from the 1950s. Based on found documents, this strange game, written by a psychologist and Mason, was seemingly an attempt to alter player perceptions through quiz and play. While it appears some of the game was lost/destroyed (the documents found were incomplete or damaged) enough was there for Nelson to create a semi-accurate version. Using a quiz game engine, and creating new fiction questions and answers, The Bafflement Fires is Nelson’s attempt at building a part fiction, part creative non-fiction world, told through the surreal and literary answers/questions of someone trying to influence how we perceived the world around/inside us, playable on a screen attempting to create its own pixeled reality. Born from the Oklahoma flatlands of farmers and spring thunderstorms, Jason Nelson stumbled into creating awkward and wondrous digital poems and net-artworks of odd lives, building confounding art games and all manner of curious digital creatures. Currently he professes Net Art and Electronic Literature at Australia’s Griffith University on Brisbane’s contradictory streets. Aside from coaxing his students into breaking, playing and morphing their creativity with all manner of technologies, he exhibits widely in galleries and journals, with work featured around the globe at FILE, ACM, LEA, ISEA, SIGGRAPH, ELO and dozens of other acronyms. There are awards to list (Paris Biennial Media Poetry Prize), organizational boards he frequents (Australia Council Literature Board and the Electronic Literature Organization), and numerous other accolades (Webby Award), but in the web based realm where his work resides, Jason is most proud of the millions of visitors his artwork/digital poetry portals http://www.digitalcreatures.net and http://www.secrettechnology.com attract each year.